Calling all RL Parents/Guardians! Calling all RL Parents/Guardians!! Calling all 6th-12th Parents/Guardians! Calling all 6th-12th Parents/Guardians!! 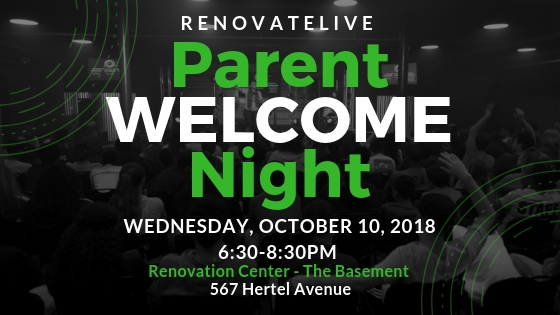 You are cordially invited to an RL Parent Welcome Night where you will have get the chance to hang out with us at RenovateLive and experience all of the fun we have every Wednesday. The event is FREE you just need to click HERE to confirm your seat. This also give us an estimate of how many families to prepare for. There will be food, faith, fellowship and TONS of fun! For questions or more information, contact Detra or Kyria at 716-819-4100 ext 109 or by email at detratrueheart@therenovationchurch.com or mstephens@therenovationchurch.com.